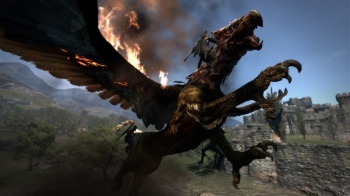 Extra difficult and Speedrun modes to be added to Dragon's Dogma via free DLC. Dragon's Dogma will get a little bit more intimidating next month with the launch of DLC that adds Hard and Speedrun modes to the Japanese version of the game. The free DLC arrives on December 4th in Japan. While Capcom promises the DLC will be out before the end of the year, we're not sure when western players will see the extra content. Hard mode, as you might have guessed, increases the game difficulty, though it's not clear if that's entails a straight stat/damage boost for enemies, or if there'll be more of them. Speedrun mode sets players a goal time in which to beat the game. Both modes unlock special equipment for your character when beaten. After launching to a pleasant critical response, Dragon's Dogma went on to perform exceptionally well for a new IP. According to Capcom's April-June financial report, the game "exceeded expectations," selling around 1.05 million copies despite the fact it "struggled abroad." The game was a huge undertaking for the developer, having been made by what was then the company's largest dev team. Some 200 plus developers worked on the game. According to Capcom's financial reports, the IPs success has paved the way for future installments and development into a full franchise.